Importance: Twin city to Guwahati and capital city of Assam. 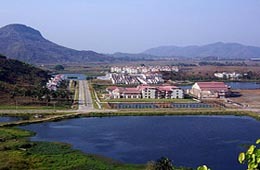 Located on the banks of the mighty Brahmaputra River, Guwahati and Dispur are within the range of 8 kms from each other. Although Dispur is the political capital of the state of Assam, many mistake Guwahati to be the capital. Other than being the political capital of the state, Dispur is famous for its auction market for tea. People are seen plucking tea leaves in the tea gardens. Situated on the banks of River Brahmaputra, Dispur has a fertile land and beautiful verdant greenery to compliment it.